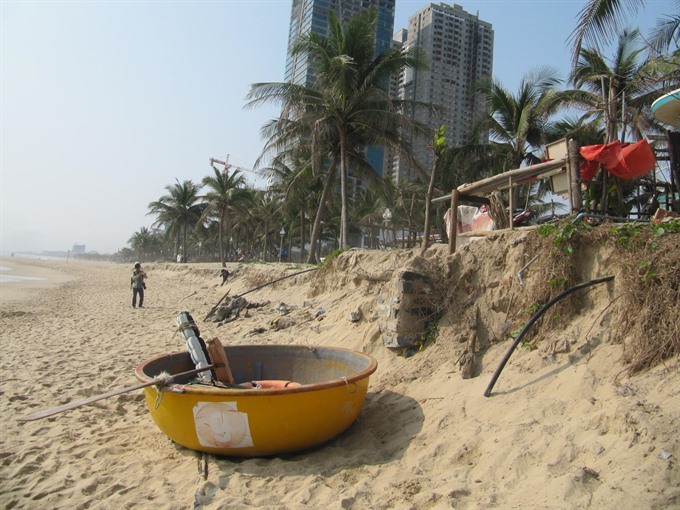 In an inspection on Thursday, Đà Nẵng Party Secretary Nguyễn Xuân Anh urged city departments to investigate the cause of Mỹ Khê beach erosion and to submit an emergency plan to protect the beach from further decay. Water has approached the central city’s sea dyke system and washed away over 300m of sand on the city’s most popular beach. Some of the concrete dyke’s foundation has been exposed, palm trees are expected to be uprooted soon, and local traders have had to move their umbrellas and bars back to the dyke. A local resident called the developments the worst erosion he’s seen in decades, and many people have voiced their worry that the beach will soon disappear if no emergency protection measures are proposed. The area near Danabeach club – an entertainment centre on the beach – was badly eroded when water smashed near the building. Local residents living in the Sơn Trà Peninsula said that a forest of casuarinas, which were grown starting in the 1960s, have helped protect the beach from erosion. However, rapid development of beach hotels and resorts slowly chipped away at the natural ‘green’ dyke, and these buildings even discharge untreated wastewater into the sea. In 2015, the city started growing casuarina along Mân Thái beach in the peninsula, after the Nari Storm damaged a 113m concrete dyke along the beach. 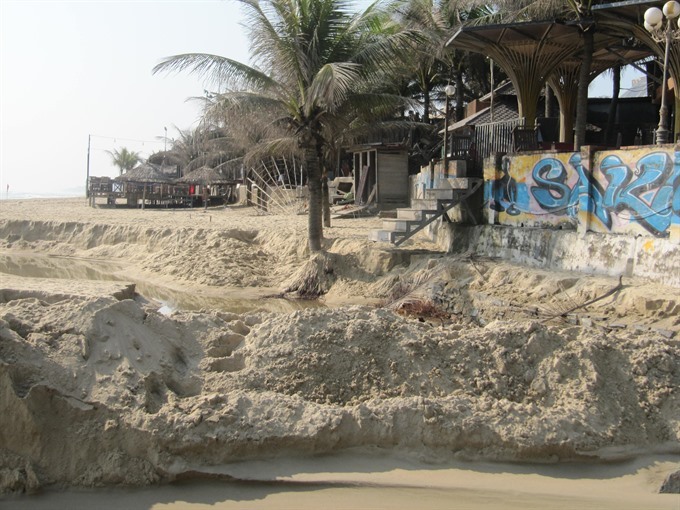 Erosion has also seriously damaged Cửa Đại beach in Quảng Nam Province over past decade, and experts have long worried that the worst erosion would expand to Đà Nẵng. Đà Nẵng, which has a pristine 90km coastline, hosts 11 public beaches. However, seven out of 15 wastewater pipes still discharge untreated household sewage into the sea.